Ex-longtime/two-time CRADLE OF FILTH guitarist Paul Allender has returned with a new group in WHITE EMPRESS that is perhaps more extreme and audacious than anything his old band has offered up in many a moon. Indeed anyone who contributed to the crowdsourcing campaign that funded WHITE EMPRESS’s debut album expecting Allender and company to deliver more horror-tinged gothic black metal may have gotten quite a jolt when Rise Of The Empress arrived – especially had they not heard the self-titled EP issued earlier this year that hinted at something rather different. While the music resembles CRADLE in its thematic leanings, orchestral flare and turbulent arrangements, it doesn’t sound much like CRADLE by any stretch. Rise Of The Empress can’t really even be classified as black metal, although there are smatterings of its influence throughout – yet when there is, it actually recalls DIMMU BORGIR circa Abrahadabra. The sound here is more of a furious, bombastic mix of death/thrash/symphonic metal and industrial/electronic music topped by some of the most frighteningly effective split-personality vocals in extreme music, courtesy of LUNA MORTIS chanteuse Mary Zimmer. Zimmer’s vocals are a battle between good and evil unto themselves. One minute she sings with the voice of an angel, the next she sounds like young Regan McNeil in The Exorcist at the height of her possession by the demon Pazuzu – though without the pea soup vomit – or is roaring and snarling like a mountain lion after a hapless hiker. The extreme range and jarring contrast of style and tone makes it seem like there is more than one vocalist working here – indeed I poked around expecting to find a male “singer” listed for the harsh vocals only to discover Zimmer handles it all. Amazing – especially when a band like AMARANTHE uses three vocalists, a woman and two dudes, to attain somewhat similar, but far less sinister or dramatic, results. There are some chorale accompaniments here, notably on “Congregation” and “Sven's Tower”. But they make for a curious match and generally seem to serve as sparring partners for Zimmer's sturm and drang instead of the window dressing they were perhaps intended as. The orchestration that is used to flavor the likes of “A Prisoner Unleashed”, “Ours To Burn” or the spectacular “Darkness Encroaching” makes for a more comfortable and well-executed fit. Along with Zimmer, Allender assembled something of an all-star cast for WHITE EMPRESS after relocating from England to Minneapolis two years ago. The lineup includes COAL CHAMBER bassist Chela Harper, DAMNATION ANGELS keyboardist Will Graney, THE AWAKENING guitarist Jeremy Kohnmann and one-time UGLY KID JOE drummer Zac Morris. 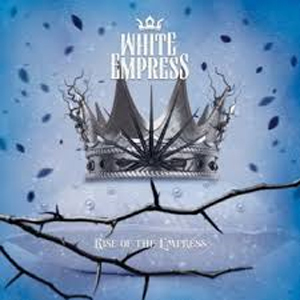 They do a remarkably solid job navigating the music's myriad twists and turns as the album winds its way through its tale of the reign of the White Empress character and her rise to power. Allender certainly hasn't lost his touch for adventurous and complex songwriting since leaving CRADLE, and his bandmates are up to the challenge here, especially Morris who ably handles the often blistering pace and multitude of time changes and Harper who provides a nimble anchor that gives the album some welcome heft and swagger. Oddly, it's Allender and Kohnmann's guitars that get muffled and a bit lost in the combination of a rather mushy mix and the overall wall of sound offered by everyone and everything else. In something this involved, something's got to give and in this case it's the guitars, which much of the time serve more as accents to Harper's propulsive bass lines than the main means of attack. There is a dearth of obvious hooks here, and the riffing tends to be spray-gunned around. Rise Of The Empress could have used a few more hooks, or meaty riffs or grand choruses or something to grab a hold of during its wild ride. There's so much going on here – often at such great velocity - that it becomes sensory overload. The “good cop” choruses on “Erased And Rewritten” and “The Ecstatic And The Sorrow” that showcase Zimmer's glorious clean vocals are notable exceptions and help pull the listener in – before, then, tearing their head off. But still. In the end, Rise Of The Empress is more exhausting than satisfying. It's an impressive debut that wants to be awesome, but comes up a bit short. It certainly deserves props for its aspirations – and kudos to Allender for not taking the easy way out after leaving CRADLE - but lacks a certain something in the execution. Maybe next time. Grab a copy of Rise Of The Empress in the KNAC.COM More Store right HERE.